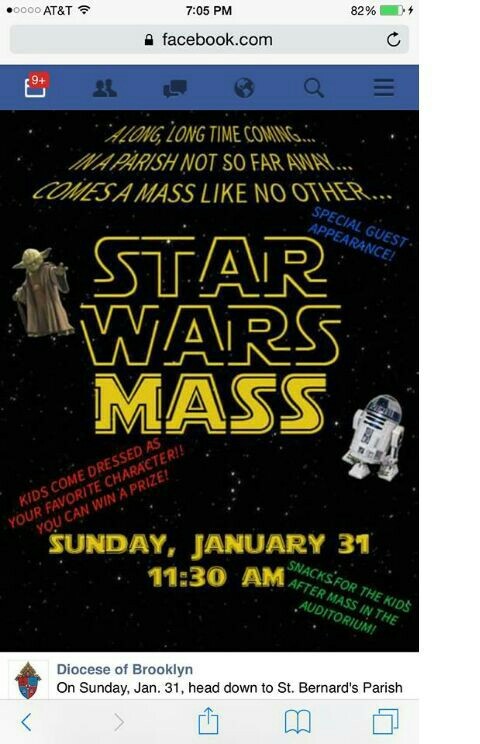 The Supposed “Star Wars” Version of The Novus Ordo Mass, was actually just a simple “Family Mass”, offered in the Mill Basin Section of The Borough of Brooklyn at St. Bernard of Clairveux, where Msgr Jamie Gigantiello is Pastor. From Info supplied from Mill Basin, next door to Marine Park, an area which uses the Flatbush Street System, as in East 69th Street, close to Flatbush Avenue, located near the Kings Plaza Shopping Centre, This “Star Wars Mass”, was not the actual Liturgy itself, but a Themed Party afterwards. 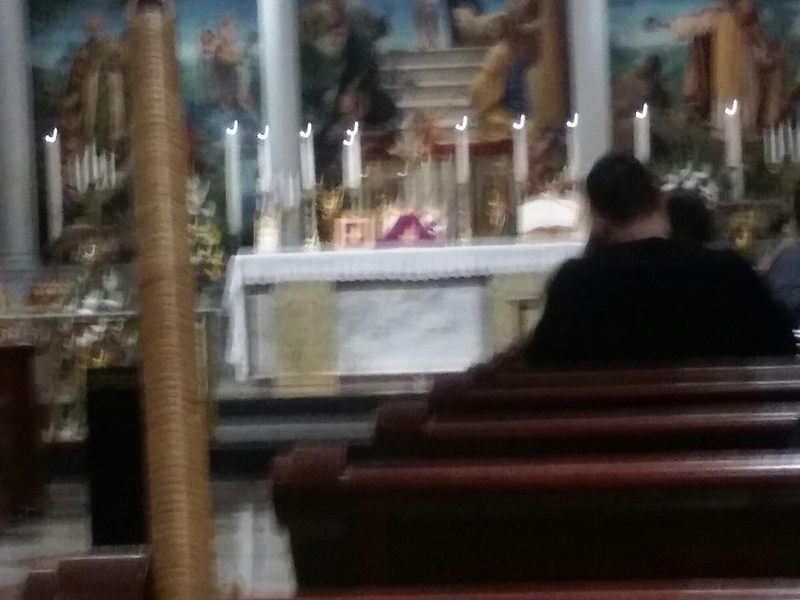 However, NO ONE, But the Priest(s), Deacon(s), Acolytes, Lectors & Servers should be in The Sanctuary, where The Holy Sacrifice Of The Mass occurs. This is Sacred Territory. I believe that Liturgical Law covers this. A Warning by Bishop Di Marzio is in order here, as well as better writing of Celebration Posters. Just Like Voris’ Top 20 Worst Churchmen of The 20th Century, where one of The Worst wasn’t even a Bishop at any time in that Century, but only his personal favorite Target in this Century. I believe that you know who that Prince Of The Church is. I went over to churchmilitant.com & on there, a Video from “The Marian Catholic”, hosted by one Christopher McCarthy, was playing about the need for “Independent Catholic Media.” McCarthy even spins the Pencil like Michael Voris when the 1st Pot Shot was fired. It was so blatant, it was as if Mr Voris had copied the script from the..ahem.. “Executive Producer”(The Big Cheque Writer in Texas), & sent along to Christopher to use on his program. Dr John Rao is RIGHT when he said one Sunday after The 11:00AM Tridentine Latin Mass at St Agnes on E43rd Street between Lexington Avenue and 3rd Avenue in Midtown Manhattan, that “Voris Hates Us(The Remnant).” Now Mr Voris is using Kids to attack Traditional Roman Catholic Media. McCarthy attacked The Remnant as an outlet, leading people into Schism, while calling ChurchMilitant.com, the ONLY outlet defending the Fullness of Catholic Truth. Like when did your channel become a Mouthpiece for “The Vortex, Where Truth & Orthodoxy is Deleted? Like I always ask, WHAT GAME ON FOX ARE YOU WATCHING? You sound like a Susidiary of Voris’ Cheque Writer. You must be subsidized by “The Cheque Writer.” Why else do you sound like The Man With The Pompadour. Your Silence about this pontificate, like your Master’s Silence, is deafening. You’re The Son that Michael Voris never had. Today, MTA NYC Transit did not fail me, as I was at St. Agnes on E43rd Street between Lexington Avenue and 3rd Avenue in Midtown Manhattan, with the United Nations only 3 Blocks away. And there was a Missa Cantata at 11:00AM. Michael Voris, SSPX SCHISM BOY, was NOWHERE to be seen. It was a Short Gospel. It was a Well Sung Mass. Some of The Regulars were missing. A number had gone the prior evening to Dr John Rao’s Party in Greenwich Village. And Father told us “Merry Christmas”, as January 1st is the 8th Day of The Christmas Octave, which is WHY it is a Holy Day of Obligation. In The Tridentine Latin Mass Calendar, Christmas Cycle ends on February 2nd on Candlemas Day, known as The Feast of The Presentation of The Child Jesus In The Temple, and that Sundays After Epiphany are part of The Christmas Cycle. Happy Christmas Cycle, even though The Novus Ordo Mass Calendar says “Ordinary Time”, which is so Generic. I was viewing a “Faith Based Investigation” on ChurchMilitant.com, called “CatholiSchism”, a drawn out piece about The Society Of St Pius X, as hosted by Michael Voris, one who grew up on the Novus Ordo Mass, and is too young to remember Vatican II. Michael Voris did NOT do any real reaearch. He did do the Special on ChurchMilitant.com. It was nothing but a Sheer Propaganda Piece. And after Mass on Christmas Day, I met the Highly Regarded Catholic Historian and Writer, The Brilliant Dr John Rao. I mentioned that “A Certain Polemicist from Detroit is in The City this week, going after Cardinal Dolan.” John asked who it was, so I told him that it’s Michael Voris. John exclaimed “Voris Hates Us(The Remnant).” I mentioned The Remnant & Catholic Family News, Michael Matt, Chris Ferrara & John Vennari & that I got a visit from The Big Cheque Writer in Texas(Originally From Long Island’s North Shore). John asked if Voris is liked at Holy Innocents, which I then remarked that Voris isn’t as liked as Voris thinks he is. According To “Captain Schism”, Pope Honorius was declared a Saint by Byzantine Catholic Churches. Wrong, Verenky Breath! Honorius I is a Saint in the Eastern ORTHODOX Churches. The Authority to make Saints in The Catholic Church, comes out of The Holy See. Vatican II, a Doctrinal Council with Teachings CONDEMNED by Previous Popes & Councils? What? The Novus Ordo Mass didn’t come from Vatican II? The Blueprint came in Sacrosanctum Concilium. It is starkly apparent that you didn’t really read Sacrosanctum Concilium. Religious Liberty putting the Protestants on a footing that they”re part of The Church? Jews, Hindus & Muslims need not convert to the One, True Faith? You declare War on The SSPX for not accepting this as Catholic Teaching? Are you sure YOU aren’t in SCHISM? Who elected YOU as Pope? Besides, WHAT GAME ON FOX ARE YOU WATCHING? Gary? Pride goeth before The Fall. And ripping Cardinal Dolan “A New One” every week is NOT going to cut it. When a 5 Hour old Baby was found in a Manger at Holy Child Jesus RC Church in Richmond Hill, Queens, NY, it was News enough for Correspondents from The Manchester Guardian & London Daily Mail, to be present, as well as Associated Press & WABC 7 Eyewitness News, all of which have Smartphone Apps. Welcome to The New Media. And via that New Media, the Story gained Attention around the World. The Old Media of Radio, Television & Newspaper, got the Information via checking Social Media such as Facebook & Twitter. The Old Media transmitted the Story via the internet. The Manchester Guardian & London Daily Mail utilized Freelancers to write the story on The Baby Found in the Manger. Both British Newspapers have Smartphone Apps. The US & British Broadcast Networks have Smartphone Apps. Edward R. Murrow, Walter Cronkite, Eric Severeid, Harry Reasoner, Robert Trout, Andrew Rooney, & Dan Rather would be utterly ASTONISHED at the Description of who you called the Holy Child Jesus RC Church Pastor. Both the Parish Administrator & the actual Pastor are recipients of The Various Stages of The Sacrament Of Holy Orders. In one part of the Story, the description of The Pastor was Amateurish at best. It was as if he was in charge of “The First Church Of The Gooey Death & Discount House Of Worship”(Attrib. John Donald Imus). It was as if the Man had not been Solemnly Ordained a Priest in The Sacrament Of Holy Orders. The Actual Pastor received The 3rd Stage of The Sacrament Of Holy Orders, in being consecrated as a Bishop & he is The Most Reverend Octavio Cisneros, DD, Auxiliary Bishop of Brooklyn. It was the Parish Administrator, Reverend Fr Christopher Ryan Patrick Heanue, who was simply referred to as Church Pastor, minus a Sign Of Reverence for him or his office, as well as Stage of Holy Orders. Oh & Another Thing, I know these two Fine Priests quite well. Just be thankful that you weren’t contacted by the Executive Director of The Catholic League For Religious & Civil Rights, Professor William Donahue, as that would have been a Bruhaha, with casualties. Another Thing is that if GARY Michael Voris at Church Militant.com had gotten involved, CBS News, the Associated Press, and both the Pastor & Administrator of Holy Child Jesus RC Church in Richmond Hill, Queens, would end up being basted & roasted like a Turkey, with both The Pastor & Administrator, being accused of being “Church Of Nice” Agents & having their supposed “Dirty Laundry” aired in public, probably lumped in with Voris’ Bugaboos, the Society Of St Pius X, & John Vennari’s Catholic Family News, Michael Matt’s The Remnant Newspaper, Christopher Ferrara, Dr John Rao, Mundabor’s Blog, Rorate Caeli’s Blog, Louie Verrecchio, Brian Mc Call, Patrick Archbold, Fr Thomas Rosica, Professor William Donahue, Pope Emeritus Benedict XVI, Pope St. John Paul II & Timothy Michael Cardinal Dolan(As Usual), Et Cetera. This is the Modus Operendi of “The Warehouse In Detroit.” A Week Long Sensationalist Special would be produced with Statements taken out of context, by this Morton Downey Jr Wannabe. And he would have a Studio Audience for this one, probably at FOX O & O WWOR9 In Secaucus, NJ, where Morton Downey Jr’s Show originated from. Acuracy & Clarity is all that is asked for, along with Objectivity & Charity.